Wassily Kandinsky�s 1923 Composition VIII is a sublime marriage of forms that results in a fusion work that seems to narrative the lofty ambitions of early-twentieth century Modernism. Music and movement is Kandinsky's mantra in Composition VIII, what was then a noticeable departure from his initial stylistic hallmarks into what would become one of the most idiosyncratic and recognizable works in Modernist painting. Having first produced abstract landscapes, by the First World War the artist began to shun figurative representation entirely and began developing a free-form approach to the creative process. In 1909 Kandinsky painted his first of the Improvisation series and in similar fashion approached the conceptual basis of his first Composition a year later. His use of numbers to signal the series of paintings as 'attempts' were initially influenced by the numerical titles adopted by more of the experimental elements in what would become known as Modern music. Kandinsky's life-long exploration of the interpenetration between music and art began with these explosive attempts to visualize sound. Indeed, it was music that was the first medium to express the shape and identity of Modernity, emerging in the late-nineteenth century with Richard Wagner and crystallizing through the works of the composer Arnold Schoenberg. 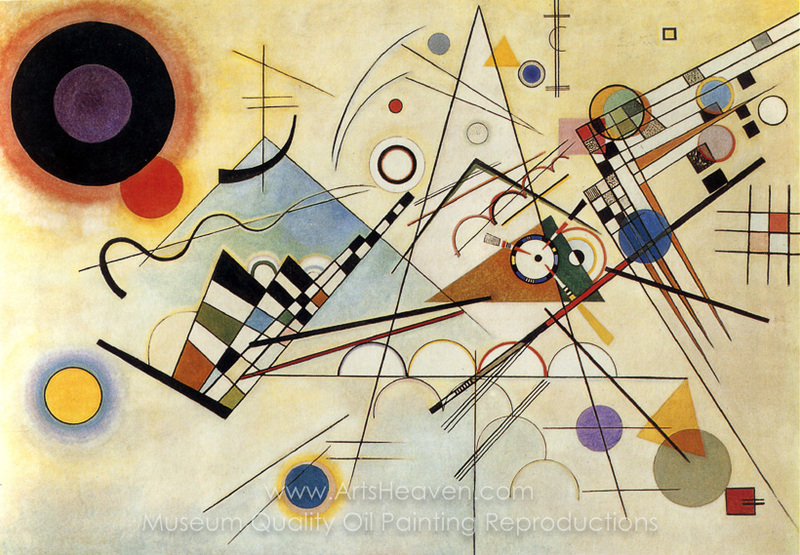 It is important to note that Kandinsky�s Composition VIII appeared exactly a decade following his Composition VII. After the trauma of the First World War and the revolution and civil war that had ravaged his native Russia, Kandinsky did not abandon his fascination with the temporality of music. In fact, his palette and ambition appeared to be liberated over the ten-year gap, forging a more articulate and fluent expression not constrained by any figurative element. In Composition VIII the viewer, like the listener, is free to interpret the radical and spiritual actuality achieved on the canvas. Staggeringly confident, Kandinsky's style seems to swagger in from nowhere, all spun in a web of unique lines and shapes that come together to describe both order and chaos. Less outwardly full of foreboding as his previous Composition VII, Composition VIII seems to exist in solidarity with the energetic and boisterous innovations taking place in the hothouses of Communist Russian schools. Listen to Wagner's Lohengrin and take a glance at one of Kandinsky's Compositions, the effect is immediate and the duality quickly apparent. The ability to stage a leitmotif and conjure the jagged harmony of music through paint is surely Kandinsky's crowning triumph. 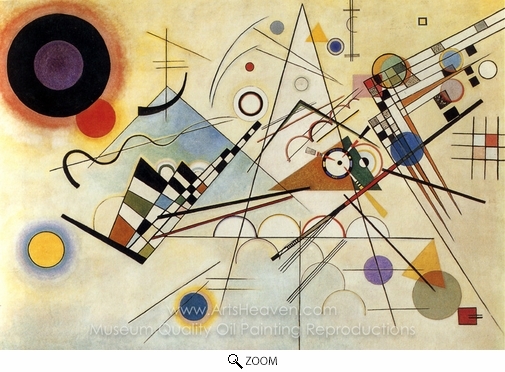 Decorate your home or office with our beautiful museum quality art reproduction of Wassily Kandinsky Composition VIII (No. 8) painting. Why settle for a print, poster, giclee or canvas transfer when you can grace your walls with a genuine oil on canvas painting reproductions for sale at up to 75% below gallery prices. You are commissioning an authentic hand-painted oil painting on quality artists canvas. Painted by professional artists brushstroke-by-brushstroke with attention to all details. Order your Masterpiece today and get Free Shipping to your door direct from our studio.